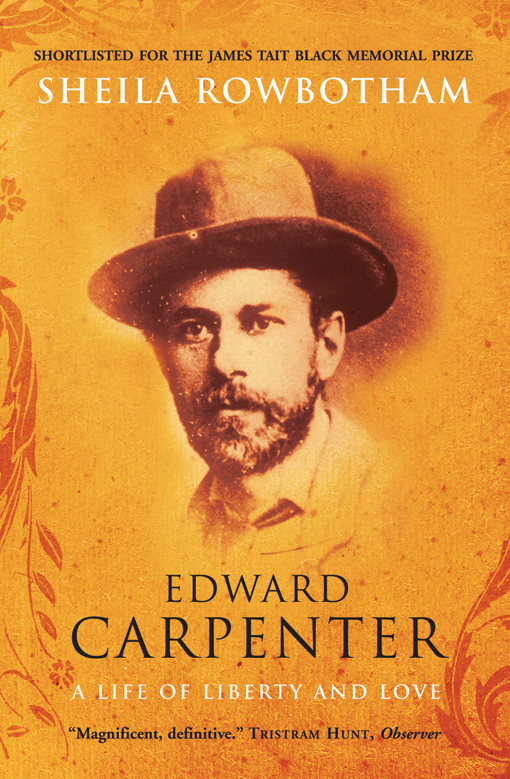 In her lengthy review of Sheila Rowbotham's Edward Carpenter: A Life of Liberty and Love for Politics and Culture, Jennifer Miller declares the book an "excellent new biography." [Edward] Carpenter is placed at the center of a complex constellation of politics, love, philosophy and activism making the biography an enjoyable and informative if at times unruly read. Rowbotham draws heavily on Carpenter's autobiography My Days and Dreams, as well as personal correspondences with his vast network of friends and lovers. So it is no surprise that we learn Carpenter's politics as much through his personal interactions as through his published work and activism. Rowbotham masterfully renders Carpenter relevant by writing with authority as well as a humorous intimacy that comes from spending decades studying Carpenter. Throughout the biography Carpenter is portrayed as an "outcast redeemer," a term Rowbotham herself uses to describe Carpenter's distance from the norms that governed Victorian England as well as his attempts to challenge the status quo, which was in crisis as a result of major economic, political and religious transformations. Visit Politics and Culture to read the review in full.